Not somewhere I’d thought about visiting, Zaragoza never featured on any must-see list I had stashed away. Husband had been a few times on business, when he needed to make a trip the week before Easter and we realised Son was off school we decided to join him. 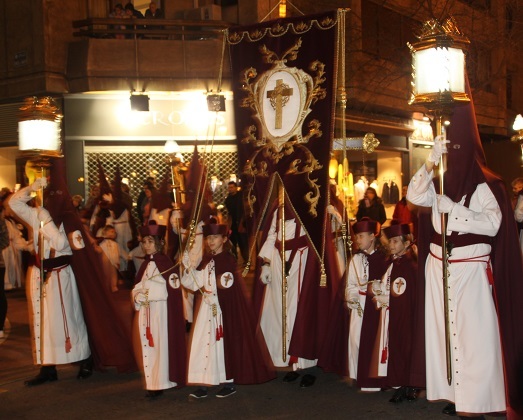 Husband had often declared how much he liked Zaragoza, and that, together with the fact our time there would coincide with the Holy Week or Santa Semana processions meant I was getting keener by the minute. I do admit to having to look up exactly where we were headed on the map – I knew Zaragoza was somewhere vaguely north in Spain, lesson learnt I found it in the north east of Spain mid-way between Barcelona and Madrid in the ancient land of Aragon. It tends not to be on the main tourist trail but having been there now, I can safely say I do not understand why that should be. It is cosmopolitan and buzzing but with history galore – Catherine of Aragon and her father Ferdinand both came from this area and it was Ferdinand’s marriage to Isabella, the Queen of Castille and Leon that led to the unification of Spain. We flew budget airline into Barcelona and drove 190 miles west for 3 hours to Zaragoza. Not a particularly interesting journey but it did give us a feel for this flat, dry province. 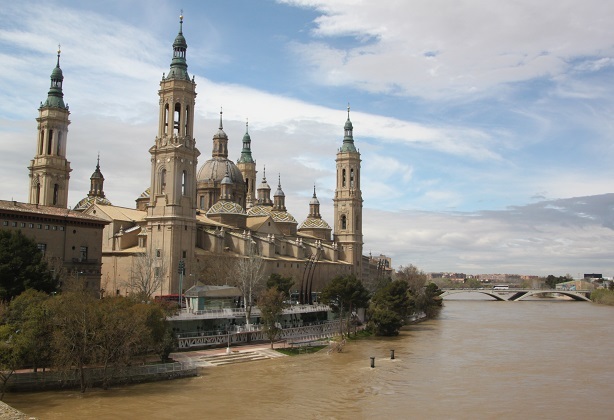 Zaragoza though straddles the Ebro – supposedly Spain’s greatest river – in a fertile plain. Founded by the Romans in 14 BC, the Roman street plan still defines the heart of the city and we saw remains of the forum, baths and theatre. 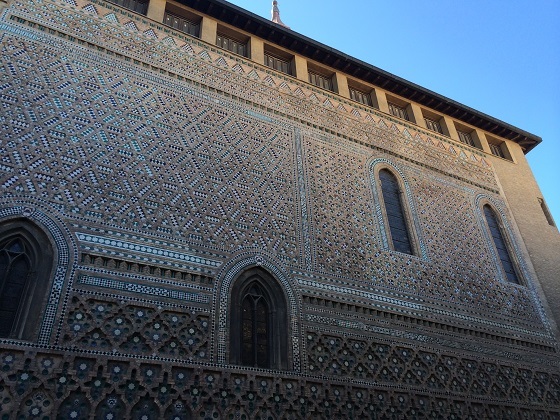 It is not all about them though, the city has been a capital for Moors and Medieval kings and we found a stack of Moorish, Romanesque, Renaissance and Art Nouveau architecture. The city was bustling and had the most wonderfully wide boulevards. We found not one but two cathedrals – this is still a pilgrimage centre after the legend goes that the Virgin Mary appeared to St James on the banks of the river and ordered a church to be built here. The whole place felt very contemporary but at the same time had a sense of timelessness. Around the narrow streets of El Tubo is an area filled with tapas bars and it just feels like proper real old Spain. The food was delicious too – the tapas is incredible and the wine equally great. Apparently Aragon has some of the best vineyards in Spain. We all loved this small and walkable city stuffed to the brim with bars and restaurants. The basilica is drop dead gorgeous and if you want to escape all the hustle and bustle there are walks along the banks of the tranquil river. Our week was spent browsing in the shops, visiting the churches and admiring the architecture, taking in those incredible processions and basically stuffing ourselves with tapas, churros and ice-cream. Low prices and incredibly few tourists made this a gem of a place to spend Easter week. 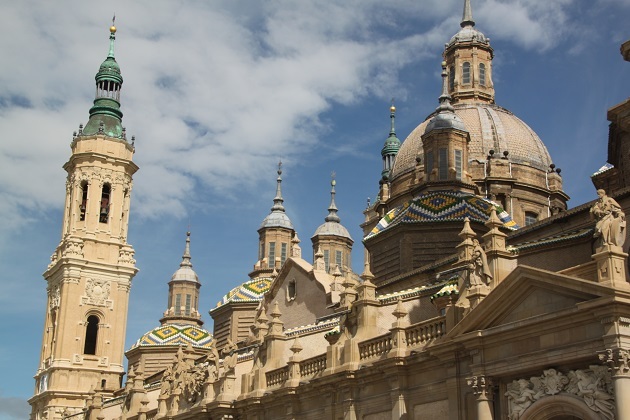 Zaragoza would be a great place to start for sure – we just loved it, such a beautiful city with so much history – completely different to those touristy places and at Easter time it is really extra special. Zaragoza is one of the most beautiful cities in my country! Glad you visited and liked it! The photos are beautiful! Btw, the road between Barcelona and Zaragoza is not the most beautiful (you have to travel though the Monegros desert…). Madrid-Zaragoza is more beautiful and if you make a little detour, you can visit the lovely waterfalls of the Monasterio de Piedra :)! We just loved the city and everything about it, from the cathedral to the tapas to those Easter processions, it is such an incredible place. We didn’t mind the drive from Barcelona really – just a bit tired from a super early morning flight!! We did actually make the journey to the Monasterio de Piedra and loved it there too – I will blog about it eventually, it’s so lovely I couldn’t not!! Zaragova looks utterly fascinating. Isn’t that the best way to discover places, kind of by accident. Absolutely – no expectations and the fact this was a work trip where we just tagged along, sort of a bonus trip but it was just wonderful. It is such a stunning city, very beautiful with loads of history and that tapas scene is just amazing. Buzzing and a lovely place to explore – we just loved everything about it. I totally agree although a part of me would rather keep it a secret – selfish!! That’s definitely something to look forward to!! If the heat gets too much you’ll just have to keep going indoors for more wine and tapas!! Looks lovely. I’ve been fascinated by Catherine of Aragon, poor woman, since I was a teenager. The first historical biography I ever read was of her so she set me on a path for life. She is a very intriguing character for sure, I got a little obsessed with Catherine after a visit to Hampton Court so it was quite nice to visit Aragon. I have never traveled to Spain, but this village looks like my cup of tea! Thanks for sharing it with us! It’s a beautiful place, quite different to anywhere else in Spain I’ve ever been and very much off the tourist track which was especially refreshing. That’s what I like the most about it! This place should definitely go on the list for Spain! It looks gorgeous! What a treat to find such a gem. It was a last minute tag along work trip but what a wonderful time we had. Zaragoza is indeed a gem and I’m so grateful we got to go along and explore. He-Man is going to Hong Kong and I wish I was able to tag along. Unfortunately, I can’t go. You were blessed! Now that is a trip I would love to do as well, Hong Kong would be just amazing!! Mine too!! I’ve been to some well known places in Spain but always prefer off the tourist track – this place is a real gem. Its so good to get off the beaten tourist path sometimes. That looks like a great place to visit, if a bit long to get to! 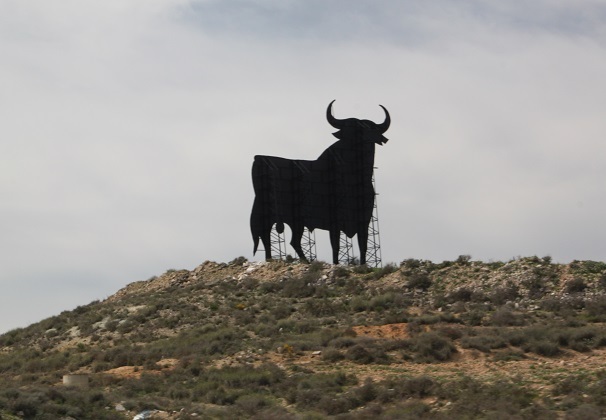 It’s mid way between Barcelona and Madrid so you could choose either but still have a bit of a drive to reach Zaragoza. There is a high speed train from Barcelona which looks great but we wanted a car to be able to explore a little around the city too. I think you can fly from Stansted direct to Zaragoza but then you have the trek down there if you live up north!! Looks lovely! I’m pleased you had such an enjoyable time in what looks like a beautiful city! It is such a gorgeous place, we were so glad to have tagged along on this work trip and discovered a gem! The architecture looks beautiful in your photographs. What an interesting place to visit! Thanks for sharing it. It’s a real mix of different eras and styles which make the whole place fascinating and beautiful to look at. It was such an engaging city, we loved it! I know exactly what you mean, I’d heard of it but it meant nothing to me and I could never have picked it out on a map. So glad we got to go there, it is a hidden treasure. I’ve never heard of this place but it looks beautiful. I love places that aren’t the typical touristy places, where the crowds are not the focus of life. We need more places like this. Nice post, Joy. Thanks George, it was really lovely and the lack of tourists made it very special. Joy, I have to admit that I had never heard of Zaragoza and had no clue what country you were going to until I read! What a gem, love when you find places that are not overloaded with other tourists! Totally agree Pam, this place was wonderful, lots of people bustling around but not many tourists, we felt very blessed to be able to spend time here. Thanks for educating me. I wasn’t sure where Zaragoza was but you have opened my eyes to another very interesting place. It is a wonderful city, full of history and culture and a lovely place to spend time. Not many tourists as well, the icing on the cake. 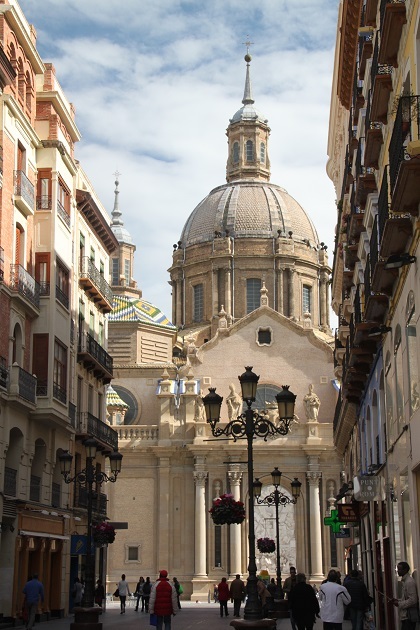 Zaragoza is definitely one of those places, full of history and culture but empty of tourists – just perfect!! What lovely photos – the city is more beautiful than I ever imagined. I used to drive around the outskirts of Zaragoza with great regularity when travelling between Spain and England, and what I saw of Zaragoza looked extremely unattractive! The centre is really beautiful Susan – we were really taken aback at what a lovely place this was, streets made for strolling, set on a river and that gorgeous church – it’s a shame the outskirts were so misleading!! Looks like a stunning city and although it was not part of your original plans, looks like a fantastic find. It is a lovely place to visit and one of those trips we weren’t expecting much but were completely blown away. I was supposed to visit Zaragoza last year, but missed my flight. I’ll have to go one day! Oh that’s a real shame, Zaragoza is just gorgeous, hopefully you’ll get the chance some time in the future to go there. Visiting anywhere in Spain is good in my book..love that country! Sounds like Zaragoza being off the radar had its benefits.. It was such an incredible city to visit – felt like we were discovering something no-one else had!! The tapas and churros are amazing here – we tried plenty and loved them!! Sounds a fascinating place Joy! 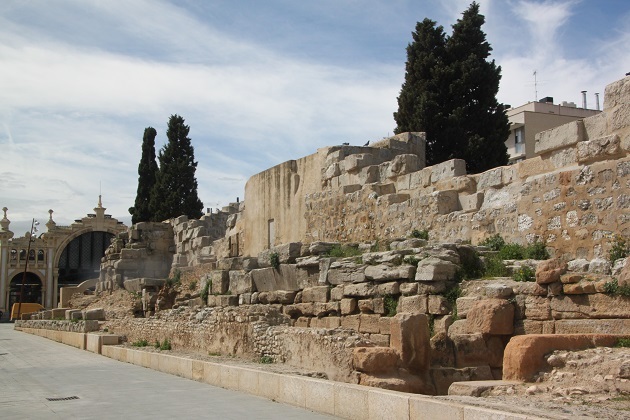 The history is so interesting and the bars and tapas sound a great way to spend a week’s holiday! Have never been to Spain though Monsieur has many moons ago (he stayed in a small village near Leon in a mountainous area) and Mlle has ben to Barcelona, Valenica and San Sebastián. Zaragoza sounds well worth a trip! We’ve been to various places in Spain down the years Rosemary and always enjoyed it there. Never been to San Sebastian though, one of our friends has recently and it is definitely sounding more than interesting to me!! This was an unexpected trip for us, never planned to visit or had any desire to go to Zaragoza, we just tagged along on a work trip but it blew me away. Full of history and culture, great food and those incredible processions – I would definitely recommend it!! Hope you’re having fun on your travels.. I read your Zaragoza posts backwards – I am soooo looking this up now! 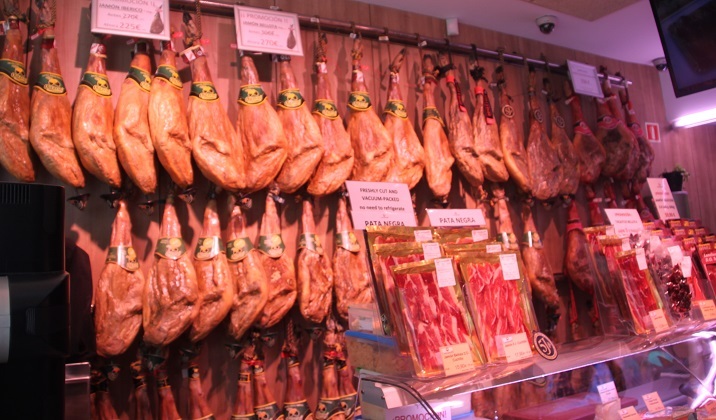 I seriously would be happy to spend a week here – I love ‘old’ Spain and the food – those hams looks amazing! The food here was extra specially superb – known for its tapas there are stack of places and it seemed like the locals eat out most evenings – though why wouldn’t you if you had choice like that!! You have really captured the beauty of the city with your photos. I would love to visit one day. It is a beautiful city – full of culture, history and lovely buildings, hope you do get to go there some day!